What does it take to be a winning youth coach? Listen in as Melody Shuman shares stories and discusses her journey to becoming a successful youth sports coach. Melody Shuman is a martial arts world champion. She started and ran a successful chain of martial arts schools, then re-invented her entire business and has created a booming business teaching martial arts, and teaching others how to start their own schools. Most martial art programs were developed for adult males. Melody has studied teaching and designed her schools to teach males and females at the appropriate age level. Goldilocks concept – Not too hot, not too cold. Create just the right level of challenge that is a slight challenge, but attainable. One kid Melody coached would get nervous and cry when in pressure situations. Melody and her team kept supporting him, and it slowly got better and better over time. 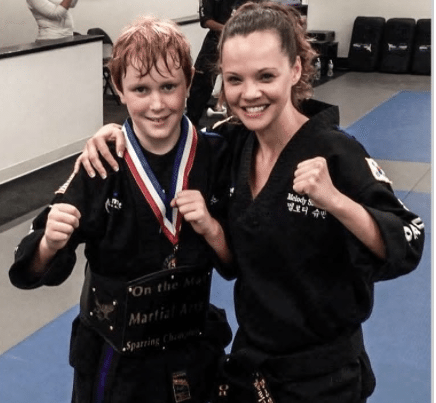 Melody emphasized: ‘You’re measured best by how you carry yourself under pressure.’ When this boy took his first black-belt test – he was the first student she ever had achieve a perfect score. He has gone on to win national level competitions. Melody was competing in nationals as a 21 year-old. She made it to the championship round, and they went to extra-time. Melody got cocky and spit out her mouthpiece – her competitor knocked out 2 of her teeth and chipped 5 others. Focus on the athlete’s mind. When creating drills – make them age appropriate and make them competitive and fun. This entry was posted in Podcasts and tagged in Aspen Institute, athlete, baseball, basketball, Carol Dweck, Changing the Game Project, changingthegameproject.com, cheerleading, coach, Coaching, coaching podcast, coaching your own child, coaching your own kid, coaching youth, coaching youth sports, dad, dad coach, Daniel Coyle, Daniel Siegel, daughter, ESPN, football, gymnastics, hockey, kevin jans, lacrosse, Melody Shuman, mental toughness, mental toughness kids, Mindset, mlb, mom, mom coach, national alliance youth sports, nays, NBA, NFL, Parenting, pca, peak performance, Pete Carroll, podcast, podcasts, positive coaching, Positive Coaching Alliance, Project Play, skillz connect, skillzconnect.com, skillzworldwide.com, soccer, softball, son, sports, sports podcast, sports psychology, sports specialization, swimming, talent code, TEDx, The Classic Guide to the Mental Side of Peak Performance, The Inner Game of Tennis, volleyball, W. Timothy Gallwey, Whole-Brain Child, winning, Winning Youth Coaching, Winning Youth Football, youth, youth coaching, youth sports, youth sports podcast.